A tropical to sub tropical plant the Custard Apple is a small evergreen tree (semi deciduous in cooler climates). The taste is much as the name suggests, a custard taste with a hint of apple. Although they are sometimes described as tasting like a cross between a papaya and an apple, either way they are sweet when ripe. The custard like fruit is green on the outside with a creamy white soft textured flesh. Widely grown in India, and through South East Asia the fruit is sold to be eaten fresh or used in cakes, purees as well as drinks. In Australia Custard Apple trees are grown in Queensland, and will reach between 3 and 10m in height depending on variety. They are a spreading tree and the fruit produced is sweet. In Australia they are often grown on Cherimoya rootstock, so we are looking at grafted varieties in commercial production as well as those sold for home gardens. When ripe fruit will appear to be evenly coloured and usually yellow to brown. They are however picked when green as they ripen off the tree. Fruit is large, weighing over .5kg in many cases. Fruiting period is from autumn to early winter. Requiring a warm climate nearly all Australian production is in Queensland, much of which is exported to Asia (Australians do not seem to have discovered these wonderful fruit yet). Custard apple trees prefer a well drained humus rich soil. Being a tropical to sub tropical fruit, they do like warm conditions and good moisture. However very high temperatures are not suited, a range from 25 C to 28C is most suitable for optimum fruit set. They require a humus rich deep soil and are usually grown in valleys where they are protected from strong winds. They do not like frosts. Drainage is important, and in areas of heavy soil it is advisable to plant on mounds to improve drainage. These are a semi – deciduous tree, they will drop some of their leaves in winter. Being relatively pest free, they are well suited to growing organically. It is best to remove root competition as these are a shallow rooted plant. Mulching around the root zone to the drip line will help retain moisture and reduce weeds beneath the tree. Pollination is the biggest reason for poor fruit production. Hand pollination can overcome this. You can grow custard apples from seed, however the named cultivars generally produce superior quality fruit. Custard apple season will depend on the climate, from early summer for around 3 – 4 months. Tropical climates are the first to produce fruit, those areas with more temperate climates are the last. 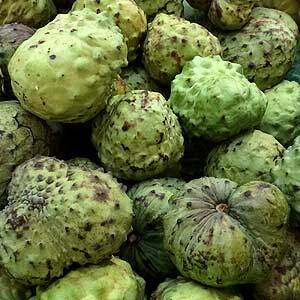 A few varieties are promoted as ‘cold climate’ custard apples, Annona cherimola cultivars in particular. They will need a warm protected position. A humus rich moist soil and lots of compost. A single tree may need to be pollinated by hand to ensure fruiting. So you can grow some varieties as far south as Melbourne and more easily in Sydney, they will be deciduous in cooler climates and will need a protected position. How long can you store Custard apples. Custard apples are stored in cool rooms, the fruit ripens at room temperature, and they are ready to eat as they begin to soften. This means that storage and ripening time will depend on temperature. These trees are a hybrid between Annona squamosa (Sweetsop) and Annona cherimola and a few other plants are also known by the same name. The most popular variety for commercial production is ‘Pink Mammoth’, large full flavoured fruit, also known as Hilary White. ‘African Pride’ is also widely grown, the fruit are smaller and have ‘more pips’ however they produce fruit at an earlier stage. A new variety for home gardens is Tropic Sun, a smaller sized tree that will reach around 3 metres in height. KJ Pinks are said to be self pollinating and provide better fruit production. Annona squamosa is commonly called the Custard Apple, also known as the Sugar-apple, Sitaphal, Sweetsop, Cherimoya or Green sweetsop. The closely related Annona reticulata is commonly called Ramphal or Bullock’s Heart Tree.